Yeah. They've been great with everything thus far. This was actually our first issue we really ran into them with. They just said it wasn't possible again. I'll implement a fix for it then. We got it working! Woo! \o/ It looks great and I cannot wait for it to replace the Private Message system one day. 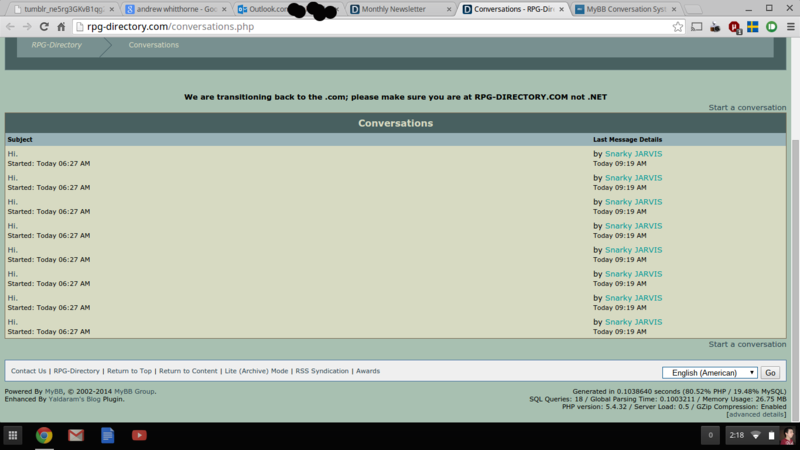 Conversations is a perfect feature that really brings the PMs on par to the other grand softwares. While we don't get alerts, or notifications we have a message waiting it does work quite well and works on a large forum. Great! Glad you managed to get it installed There aren't currently any alerts as it will be using MyAlerts once I finish version 2.0.0 of that. There are quite a few other features currently missing too. This won't ever be released, I'm pretty sure of this! Nah, I'll be releasing it after MyAlerts 2.0.0 and the new version of SimpleLikes. I did notice one thing. Every time somone replies to a conversation you get a new listing. So... We have dozens of conversations that are the same thing. Edit: Yay! Simple Likes and My Alerts Love those! Ah, now that definitely shouldn't be happening, but I think I know why it is. I'll have to double check the logic in the code. Take your time! It's an awesome system. Edit: IS there plans to allow people to add a new user to the conversation later? Yup, that's the plan There should be a sidebar in conversations showing current participants and users will be able to invite others to it. Current time: 24-04-2019, 01:53 AM Powered By MyBB, © 2002-2019 MyBB Group.